The Western Bulldogs’ 2016 premiership came from nowhere. A club with no luck, no stars, no right to win, they swept to victory on a tide of nationwide goodwill. 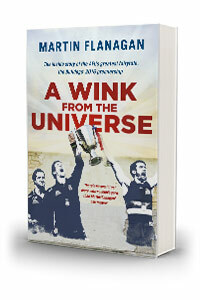 Martin Flanagan talks to John Harms about A Wink from the Universe –a book about how a group of people can will a miracle to happen. This event will run from 10:30AM until 11:30AM on Sunday June 17th at the Williamstown Town Hall Supper Room as part of the Willy Lit Fest. Tickets are $20 ($17 concession) and can be purchased here.